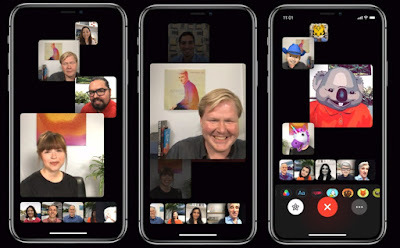 Apple is launching group FaceTime chats with iOS 12 that’ll be able to accommodate up to 32 participants. FaceTime will be integrated into Messages, so you can easily transition a group chat to a group video call. FaceTime will also feature filters and Animoji, as well as the company’s new Memoji. Apple demoed the new FaceTime, which features tiles of people’s faces. Below the main tiles are a “roster” of other participants. People who talk are highlighted in the tiles. It’s an interesting interface that looks unlike other video chats. Users can also manually select people they want to see highlighted. » Apple buys Dr. Dre¡¯s Beats Electronics for 3billion dollars.